BOLDplanning Holds Official Kick-off Meeting with Liberty County, Georgia and State Officials to Update County’s Hazard Mitigation Plan – BOLDplanning Inc.
On Wednesday, February 6, 2019, new BOLDplanning customer, Liberty County, Georgia, hosted its official Multi-Jurisdictional Hazard Mitigation Plan (HMP) kick-off meeting. Speakers included Shelby Meyers, State Hazard Mitigation Officer, State of Georgia; Larry Logan, Director of Emergency Management, Liberty County; and Brittney Whatley, CBCP, plan writer from BOLDplanning. The meeting hosted over 30 participants from local jurisdictions, as well as several State and County representatives. 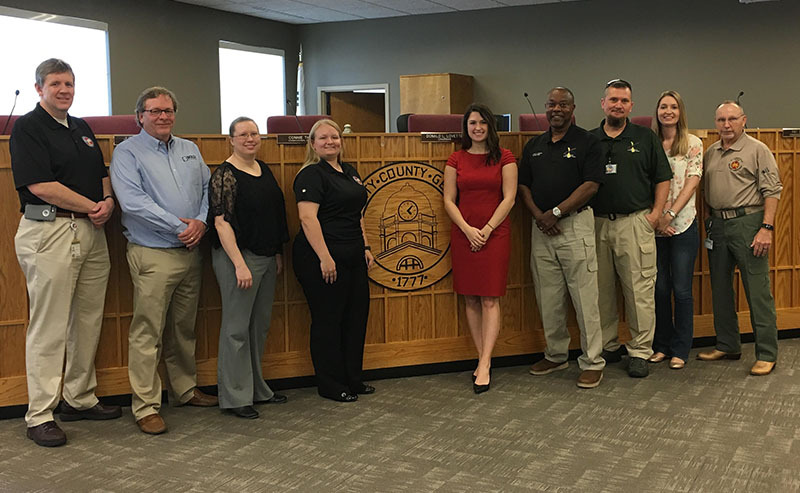 Pictured here, left to right, are: Alan Sloan, Hazard Mitigation Planning Supervisor, Georgia Emergency Management Agency (GEMA); Rick Wimberly, COO, BOLDplanning; Jessica Gibson, FEMA Region IV Hazard Mitigation Plan Reviewer; Shelby Meyers, State Hazard Mitigation Officer, State of Georgia; Brittney Whatley, BOLDplanning; Larry Logan, Director of Emergency Management, Liberty County; Bob Dodd, Emergency Management Specialist, Liberty County; Samantha Abbgy, Administrative Assistant, Liberty County; and Mac McPherson, Emergency Manager, Fort Stewart (the largest Army installation east of the Mississippi River). The information and relationships gained during this formal kick-off meeting will be invaluable to plan development; County, State and FEMA approval; and ultimately, plan adoption. On behalf of BOLDplanning, thank you for your business and your southern hospitality. We look forward to seeing you again soon.